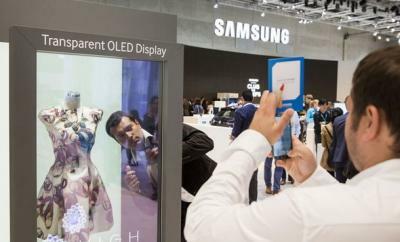 In June 2015 Samsung Display unveiled large-size (55") mirror and transparent OLED display panels. According to reports, Samsung plans to mass produce these by the end of 2015 at Samsung's existing A2 Gen-5.5 AMOLED fab. Now at the IFA 2015 trade show, Samsung is exhibiting those two displays, which they say are the first transparent display panels for commercial use on the market - which may mean that Samsung is indeed ready to ship those soon. It turns out that both the transparent T-OLED displays are touch-enabled, and also include built-in speakers. 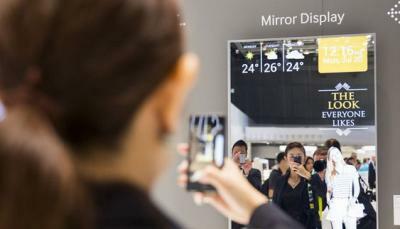 The Mirror displays are Wi-Fi enabled.